Ok. That may not be the real rationale, but for a valid reason, you wanted to have Color and Font preferences in the PreferencePage. The obvious answer for us (the plugin develoepers) would be to add ColorFieldEditor & FontFieldEditor in our existing PreferencePage. But its not obvious for the user to look into your plugins Preference Page for changing them. 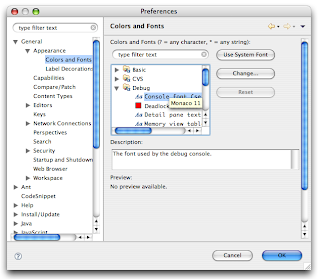 Eclipse already provides a PreferencePage for these customizations: Colors and Fonts page ( General->Appearance->Colors and Fonts ) Users might be looking into this place to change the colors & fonts. As you can see in the above image it categorizes the available preferences; gives a filter to search; provides space for description and preview; and a tool tip for the current value of the preference. This is much more than the *FieldEditor right? 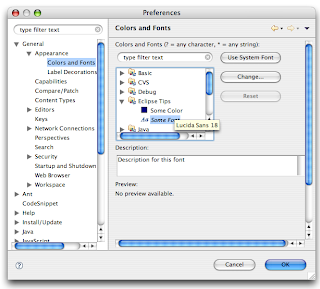 In this tip let us see how to add our preferences into that and access them. What you have seen is just the tip of the iceberg. The themes extension point has much more functionalities (The Preview is one such example). I'll explain them later, but you can see the Extension Point description here.